This morning I went on Martha Stewart’s home page and found an 8 minute video on how-to make toy sailboats. Why would toy sailboats even enter her mind? The boats were cute, but no simple task to make. Drilling, gluing, painting… 3 verbs that never enter my mind. Martha claims she always finds old-fashioned toy blocks at yard sales. Can you picture Martha driving around the suburban neighborhoods of Connecticut in her Land Rover on a Sunday morning, stopping at garage sales to pick through some stranger’s used stuff? I was grateful she had a trusty assistant in the video, who seemed to be the brain-child of the toy boats. Her name was Helen and she even used the word “hypotenuse” to explain how to properly cut the sail for a boat. Why wouldn’t she say “big side of the triangle?” That would have worked fine. I had to look up hypotenuse, a word I last used in the 8th grade. It was good to know that Martha doesn’t think up all this crafty stuff on her own. I wonder what she did with the sailboat she made in the video? She did mention they’re fun to play with in the bathtub. I am grateful for Martha’s Baking Handbook. Baking is definitely not my thing, but truth be told, when I need a recipe to bake something specific in a pinch, Martha seems to be the one I keep turning to. After a quick drive to Solebury Orchards, I walked out with 2 quarts of just picked blueberries. Too lazy to pick my own in the summer heat, I paid a premium for the farm to do all the work. A quick rinse in the sink when I got home, I realized that 2 quarts of blueberries is a lot! Since yesterday I’ve already had cereal and blueberries, handfuls of blueberries, yogurt and blueberries, another handful of blueberries and still not a dent has been made in the bowl. 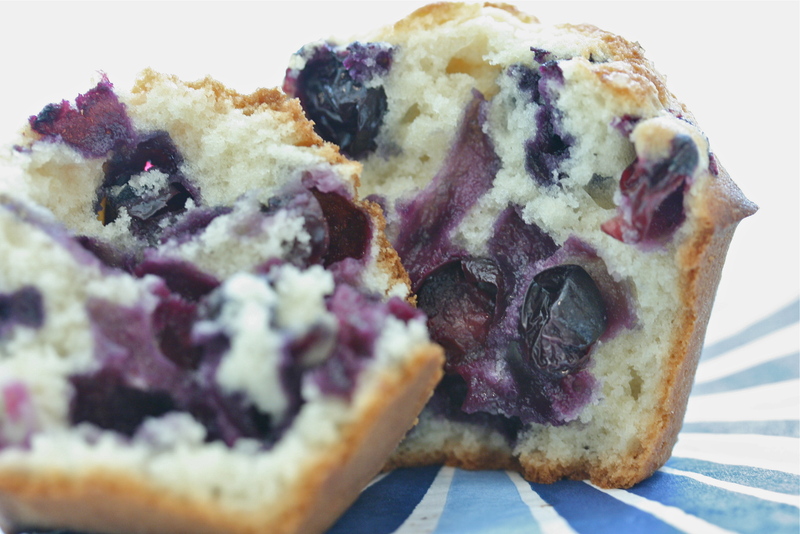 Muffins were the perfect solution and these were quick and easy to make. I’m a purist when it comes to old-fashioned baked goods, which is why I selected this recipe. 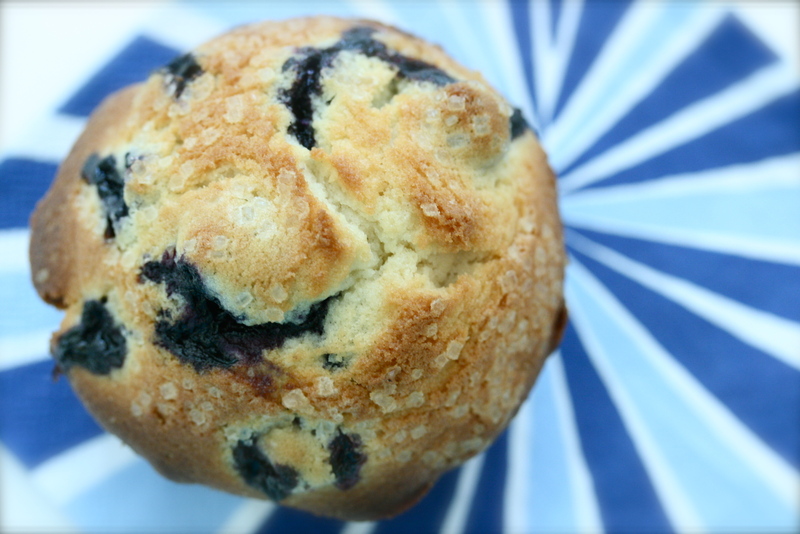 These muffins highlight the fresh-from-the-farm berries without any distractions. 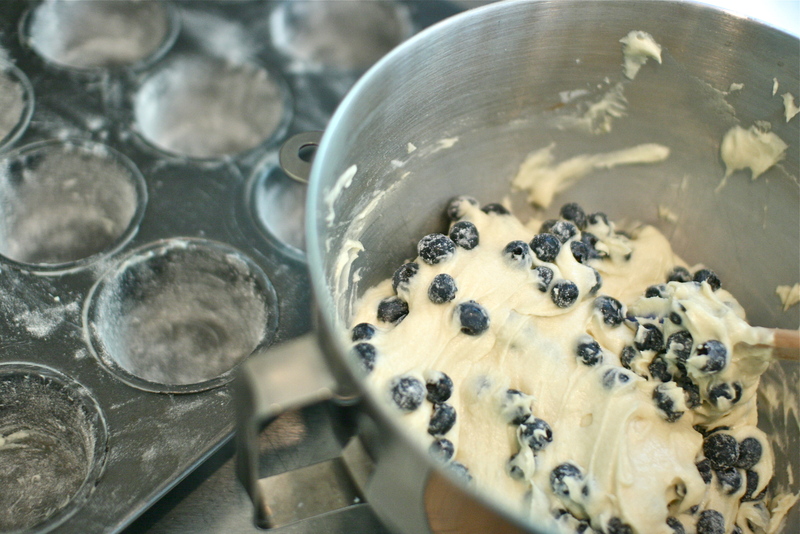 To prepare the pan, rub the muffin cups and the top of the muffin tin with soft butter. Toss in a little flour and shake it around in the pan to coat, discard excess. In a small bowl, combine the flour, baking powder and salt. Toss the blueberries with 2 teaspoons of the flour mixture in a fine mesh strainer, shaking off the excess back into the flour mixture bowl. Set the bowl of blueberries and bowl of flour aside. In a stand mixer using the flat beater attachment, cream the sugar and butter together until fluffy. Add one egg at a time, mixing until combined. Add the vanilla extract and mix. Slowly add in the flour mixture, being careful not to overmix the batter. Finally, add the milk slowly and mix until just combined. Using a rubber spatula, fold in the flour dusted blueberries. Fill the muffin cups evenly with the batter and give each muffin a hearty sprinkle with turbinado sugar (sugar in the raw). This will give the muffins that delicious crunch on the top after they bake. Bake for about 30 minutes or until golden and a cake tester comes out clean. I baked these using the convection setting in my oven and they were done in 25 minutes. Remove pan from the oven and allow to cool for 10 minutes on a rack and then turn muffins on their sides in the pan to cool. 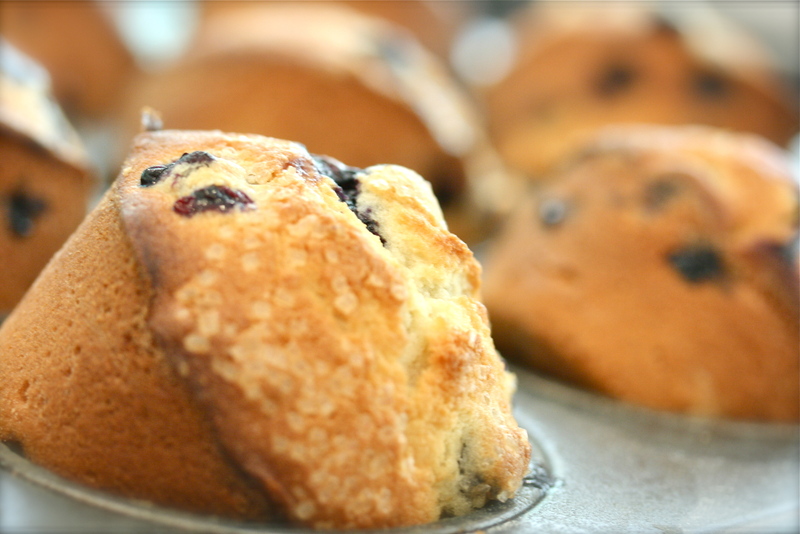 Transfer the muffins from the pan to a rack and let cool completely. I still have vivid memories of when I was a little girl, sitting around the kitchen table at my grandparents’ house in Tinton Falls, New Jersey. They had this white round table (very modern), with a single round navy blue placemat that lived in the center. There was always a set of salt and pepper shakers and a few paper napkins strewn on top of that placemat. I can still picture the salt and pepper shakers, from Dansk, walnut and brushed stainless. My grandmother loved kitchenwares from Dansk. Pretty cool if you ask me. We would all squeeze in together around the table to enjoy whatever treat my grandmother had prepared. We ate for sport. We ate because my grandmother told us to, and we ate because frankly, it’s what we all loved to do most. My grandmother could never sit down for an entire game. She was up and down the whole time, putzing at the stove or mixing up some concoction. The only time my grandmother could be still for more than 5 minutes was when Another World was on. I think it’s the only time she ever shh’d me as a child. She’d sit in her den, leaning forward towards the TV, engrossed like it was the President giving a speech. She’d munch on roasted cashews and sip her afternoon coffee, content to sit for that hour of the afternoon, undisturbed. The simplicity of life at my grandparents’ makes me smile. For so many of us, the appreciation of a single moment during the day can get lost along the way. When was the last time any of us actually sat down for an hour? 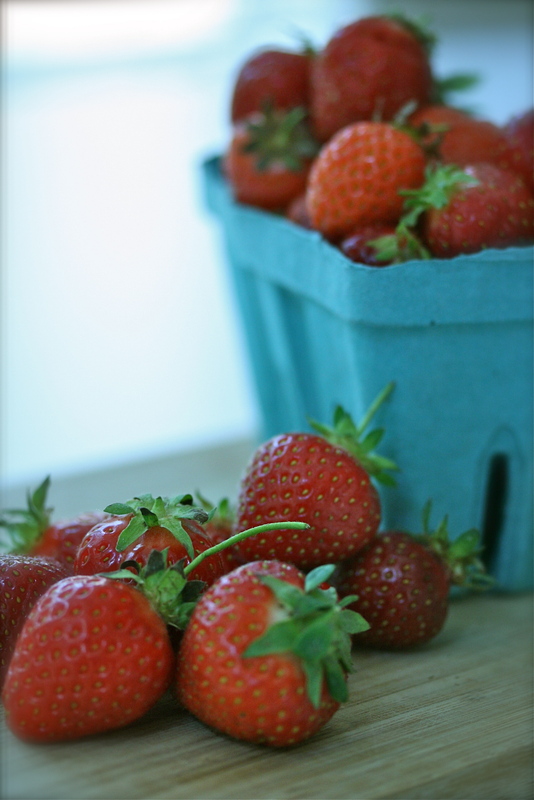 With the first patch of strawberries ready a little early at Manoff Farms, I couldn’t help but pull together this quick dessert. You see, store-bought pound cake is one of the best cheats. I learned this from my grandmother, too. Fresh fruit, pound cake and a little homemade whipped cream (it must be homemade)… what could be easier or more scrumptious? To make the whipped cream, place the heavy cream, 2 tsp of sugar and vanilla in the bowl of a stand mixer. Whip to soft peaks. I don’t like to make my whipped cream very sweet. If you prefer it sweeter, just increase the amount of sugar. 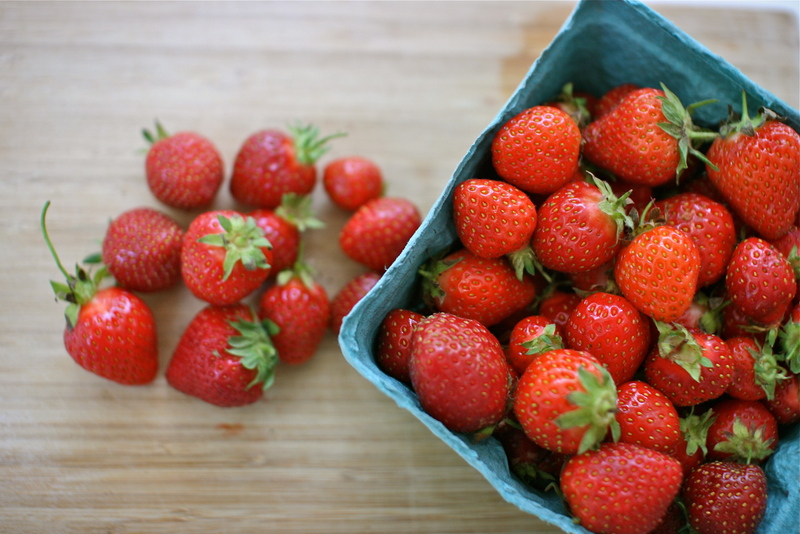 Slice the berries in half or quarters depending on their size, and place in a bowl. 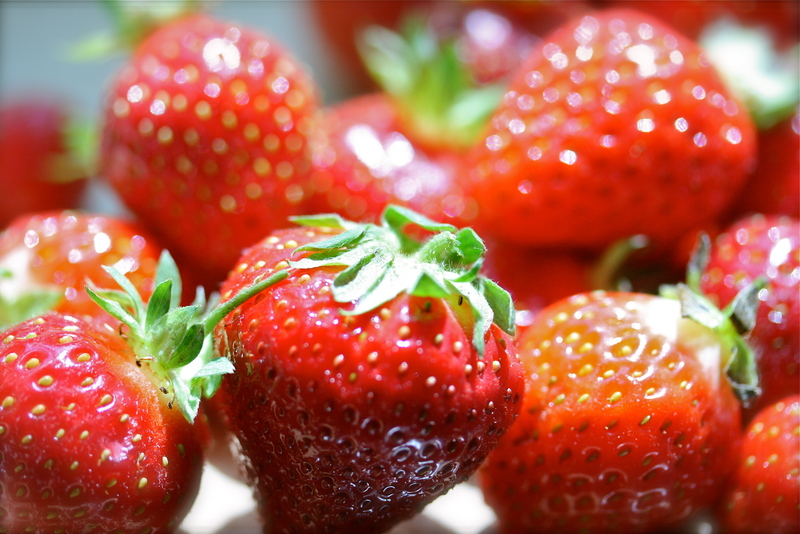 Sprinkle the remaining 2 tsp of sugar over of the berries and drizzle a couple of tablespoons of water over top. 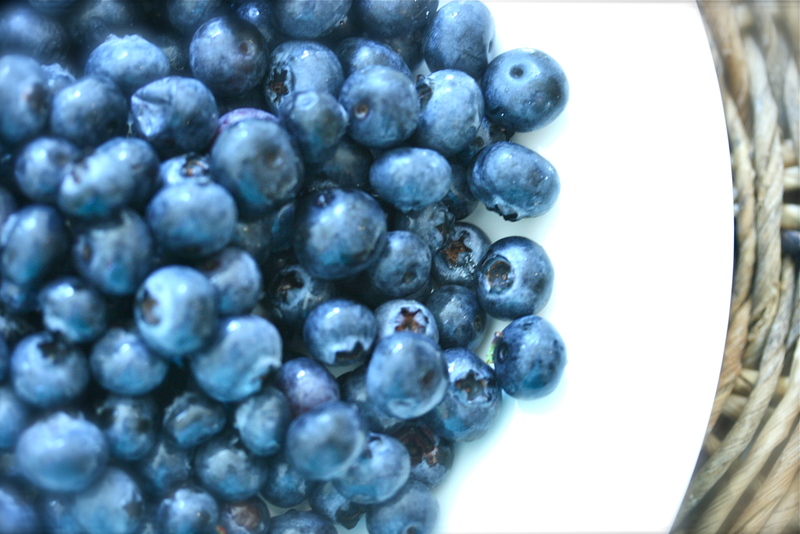 Toss the berries together, cover and place in the refrigerator. The combination of the sugar and water will macerate the berries and make a delicious sweet juice in the bottom of the bowl. You should taste the berries to see how sweet they are. You can add a little more sugar if needed. 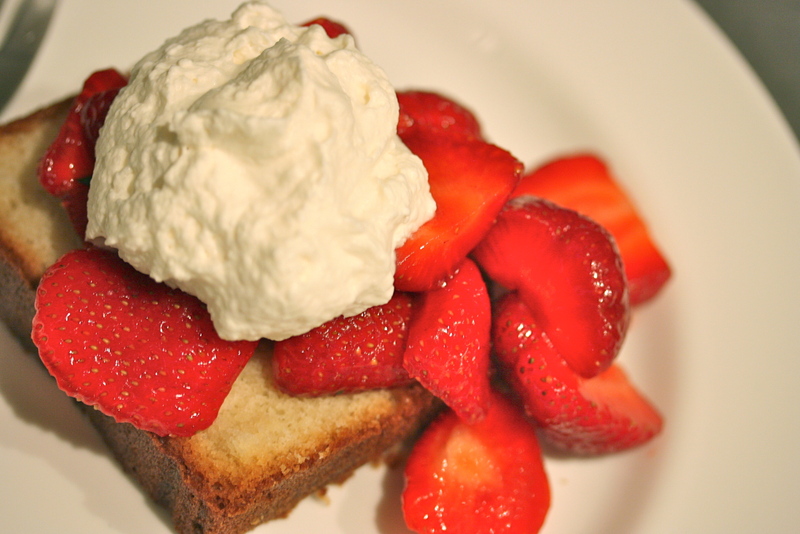 To serve, place a slice of pound cake on a plate, top with the berries and a generous dollop of whipped cream. Nothing fancy, just simply delicious.